We've long discussed how Verizon (like most U.S. cellular carriers) has a terribly-difficult time understanding what the word "unlimited" means. Way back in 2007 Verizon was forced to settle with the New York Attorney General after a nine-month investigation found the company was throttling its "unlimited" mobile data plans after just 5GB of data usage, without those limits being clearly explained to the end user. Of course Verizon tried for a while to eliminate unlimited data plans completely, but a little something called competition finally forced the company to bring the idea back from the dead a few years ago. But the company's new "unlimited" data plans still suffer from all manner of fine print, limits, and caveats. That includes throttling all video by default (something you can avoid if you're willing to pay significantly more), restrictions on tethering and usage of your phone as a hotspot or modem, and a 25 GB cap that results in said "unlimited" plans suddenly being throttled back to last-generation speeds as slow as 128 kbps. In short, Verizon still pretty clearly has no damn idea what the word unlimited actually means, nor does it much care if this entire mess confuses you. "Santa Clara Fire paid Verizon for "unlimited" data but suffered from heavy throttling until the department paid Verizon more, according to Bowden's declaration and emails between the fire department and Verizon that were submitted as evidence. "In the midst of our response to the Mendocino Complex Fire, County Fire discovered the data connection for OES 5262 was being throttled by Verizon, and data rates had been reduced to 1/200, or less, than the previous speeds," Bowden wrote. "These reduced speeds severely interfered with the OES 5262's ability to function effectively. My Information Technology staff communicated directly with Verizon via email about the throttling, requesting it be immediately lifted for public safety purposes." This being the telecom industry, Verizon's support response to the problem wasn't what you'd call top shelf. Instead of quickly understanding the dire nature of the complaint and restoring the connection to full speeds, the fire department says Verizon informed them that the fire department needed to upgrade to a new data plan at more than twice the cost. At one point, a Verizon account rep advised that the fire department should pony up for Verizon's per gigabyte rate (which has varied at prices ranging up to a whopping $15 per gigabyte). If you're playing along at home, this is nothing new. Cellular carriers often impose all manner of confusing limits and caveats as part of an intentional effort to upsell you to more expensive tiers of service you may not actually need. Historically, the FCC's now-discarded net neutrality rules allowed for this kind of throttling in cases of congestion and "reasonable network management" (though this term has long been abused). But the fire department says its connection was being throttled at all times, not just during periods of congestion. "Santa Clara could have complained to the FCC under the now-removed net neutrality system, which allowed Internet users to file complaints about any unjust or unreasonable prices and practices. FCC Chairman Ajit Pai's decision to deregulate the broadband industry eliminated that complaint option and also limited consumers' rights to sue Internet providers over unjust or unreasonable behavior." Lovely. Verizon subsequently admitted that the company shouldn't have throttled first responders anyway, as that was a violation of the company's own policies. But this being the telecom industry, customer service gaffes are a feature, not a bug. Granted, this is the same company that has fought for more than a decade to crush net neutrality while not only actively denying that's what it was doing, but insisting that net neutrality needed to be dismantled to help protect public safety. As such, there's nothing about this story that's remotely surprising. Verizon has worked tirelessly to ensure it doesn't have to be particularly transparent, whether we're talking about net neutrality or privacy, and the end result has been on proud display for decades. Back at the end of March, the Department of Homeland [in]Security issued rules stating that all electronics larger than a smartphone should be checked instead of kept in a carry-on on flights into the US from 10 airports or on 9 airlines from mainly Muslim countries in the middle east and north Africa. This was following claims by US and UK intelligence that terrorists are smuggling explosive devices in various consumer items to 'target commercial aviation'. Not only does this not pass the smell test -- anyone looking to bring down an aircraft with explosive devices won't care if they're in the cabin or the hold: boom is boom. The idea that items are going to go through some sort of super-secret screening is laughable, when red-team penetration tests find it trivial to get prohibited items onto aircraft (including via people with no ticket who bypass security screenings). And, of course, airports already require carry-on electronics to be x-rayed, and often swabbed for explosive residue. What's more, I remember seeing 'explosives smuggled on board' hysteria since Pan Am 103 almost 30 years ago, where Czech explosive Semtex was suspected to be in everything from fake muesli to electronics following the use of just 12 ounces (340g) to blast a 50cm hole in the 747's hold. A more "credible" theory is potential "cyber warfare" (a pox on that term). With electronics out of sight of the passengers after check-in, access to them is far easier for 'security services'. As well as allowing easy access to snoop on passenger electronics and data, there is a potential for far more nefarious actions in the tradition of Stuxnet. Stuxnet was a worm that targeted a certain Siemens industrial control system primarily used by Iranian nuclear centrifuges. However, it spread via infected USB drives to computers, and from those computers to other USB drives, all the while using rootkits with compromised digital signatures to hide. It essentially used a digital version of '6 degrees of separation' to eventually infect its target. What better way to spread similar malware than to infect a bunch of computers on flights to the target country? It's not just laptops either, cameras need memory cards and are just as easy to infect. As a theory, it's got a lot to commend it, but that's beside the point, because, remember, this is about 'safety' and people not taking bombs into aircraft cabins. May 30th's JetBlue flight 915 (NY JFK to San Francisco) had to make an emergency landing in Michigan after a AA lithium battery in a backpack started to smoke. When it was noticed, the backpack was moved to the aircraft bathroom which presumably dislodged whatever was causing the short. Luckily that was enough to prevent the fire from getting started, which would have soon gotten out of control. And therein lies the problem. Lithium battery fires are very dangerous, and one of the things that make them more dangerous than most other fires is that most of the things you'd do by instinct to put out a fire (smother it, put water on it) actually makes them worse. Realistically, the only way to deal with a lithium fire is to stop it before it starts, and while that happened this time, if it were in the hold we'd be looking at a downed Airbus A321 with 158 dead. Now bear in mind this is a battery designed for rugged use, puncture resistant and safe (which is why they were used in Battlebots entries, which is why I was taking them, for the Suicidal Tendencies team), in a fire-resistant case where the only available fuel might be some small amounts of hydrogen gas, and whatever items are around. 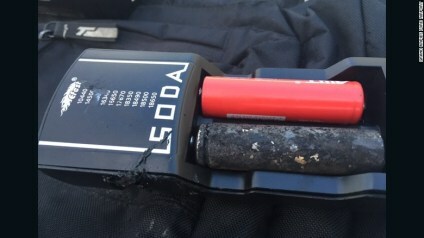 Lithium batteries generally don't come in rugged fire-resistant cases, provide their own fuel, and worst of all, physical damage (such as heavy-handed baggage handlers) can cause such damage. If you want a more specific example of the risks, just cast your minds back to last year and the Samsung note7. With just the potential for a fire with note7 battery, they were banned from aircraft for safety reasons. They weren't consigned to the hold, where they can cause problems without anyone noticing. 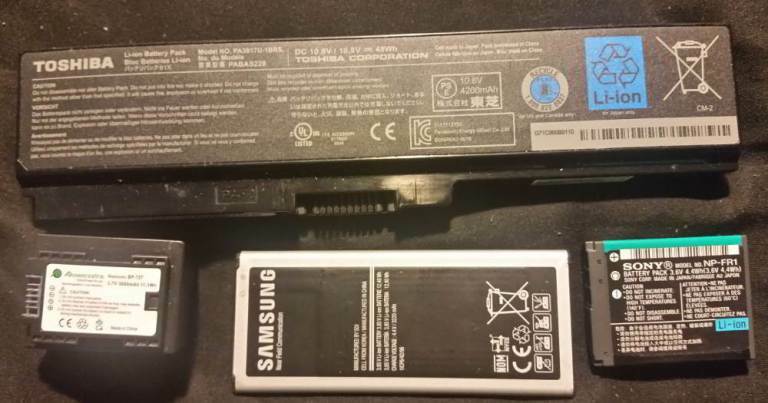 And it gets worse, Lithium-ion batteries are EVERYWHERE. Aside from the rechargeable AA and AAA batteries like the one that caught fire on flight 915, lithium batteries are in laptops and cameras. Here are some examples of lithium batteries I had to hand, that I'd take on a trip with me and have to check. 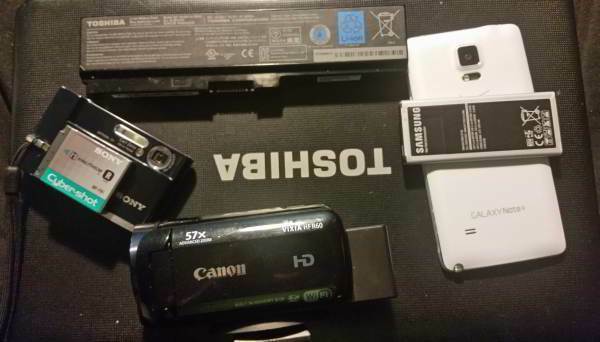 That's a laptop battery, a digital camera battery, a phone battery and a video camera battery (I have 4 of these). One of them is 10 years old, that's how long these batteries have been out there. Any of these can cause an uncontrollable fire if mishandled (and sometimes, just from age). What's more, any of these devices wouldn't take much to rig with a short-range detonation using nothing more than their own battery as the bomb. A bomb which will pass all the cursory security checks because there are no obvious chemicals (RDX, TNT, etc) to detect. As a policy to prevent bombings, it's not useless, it's actually WORSE than useless, as it makes it FAR easier to take down an aircraft with electronics, just by accident, let alone by design. Now, some might say that in this case, having lithium-ion batteries of any kind on an aircraft -- whether in checked luggage or carry-on -- is a recipe for disaster, and that they should be banned in general. But what I'm saying is that they are more prone to fire through mishandling than other battery types, and that such a fire, once it has started and takes hold, is more difficult to get under control easily. Well-maintained, well-treated batteries are safe if they're kept in the cabin, as any incident can at least be quickly addressed, as the recent JetBlue incident showed. Requiring they be put into baggage that is dropped, thrown, punted, squished, molested, rummaged through and otherwise mishandled, before being packed tightly into an aircraft hold unattended means that damage leading to a fire is far more likely, and that fire is unlikely to be discovered – let alone extinguished – before it is too late for the safety of the aircraft. And if you're wondering how to put out a lithium battery fire when started, the answer is to use a class-D fire extinguisher (which only works on metal fires) but in a pinch, salt (pun intended) or sand can be used. Good luck finding the former, or enough of the latter two at 43,000ft. In a pinch, you can use water in mist form to cool around the battery and bring its temperature down (this can take a LOT of water and time), while also isolating it from any other fuel where possible (which was done in this case). Again, this is not really feasible if the fire is in the hold. Here's a demonstration of extinguishing a laptop battery fire, and how even when prepared, and waiting for it, with an extinguisher at the ready, it can still take a minute or two to put it out. Most people would be tempted to stop once the flames go out, allowing for re-ignition.